Hey everyone, I’m back from the abyss and looking forward to the countdown to Opening Day! I’ve stayed busy this off-season jumping into family activities and calling College Hoops for ESPN. I like the moves the Crew made this winter. I’m going to miss JJ Hardy but Alcides Escobar has earned the shot to play everyday and Hardy is too talented to play anything but shortstop. Picking up Carlos Gomez ensures the Brewers stay on pace defensively in centerfield. Defense helps pitching and we all know the pitching had to be addressed. We are a month from Spring Training and all the major roster work is done. Impressive. 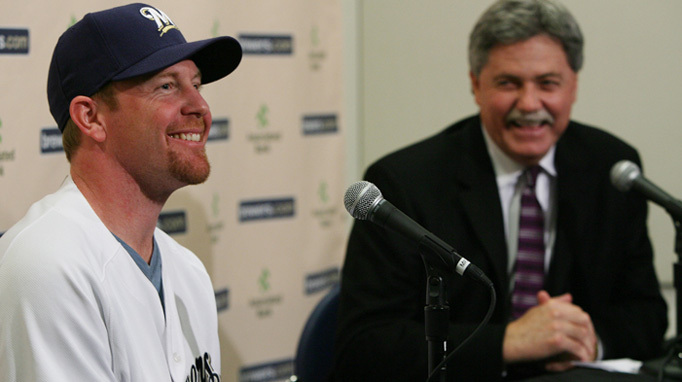 Every scout, coach, or player that I’ve spoken to about Milwaukee’s Hot Stove agreed the Brewers did very well. Randy Wolf has posted terrific numbers the last two years and his outside the lines reputation comes with high marks. I’ve been told he’s great with the fans and great with teammates. Hopefully he can deliver on the mound as well and bring some stability to the starting rotation. There is plenty more to talk about. I want to invite you to join me for a webchat Friday from 10am-11am. We can talk about the team the first half hour and broadcasting the second half. If you can’t make it, you’re always welcome to click on the comments icon below to submit your question.